SCS Software's blog: Raise your wheels! In a recent blog post we have hinted at one neat feature that is coming with the 1.14 update for Euro Truck Simulator 2- tag-lift truck axles. We have expanded the mix of available chassis for purchase from three to six. Chassis 6x2, 6x2/4 received tag-lift versions. It is not just a cosmetic visual gimmick, the physical properties of the vehicle do change with a lifted axle. With appropriate chassis, you will be able to raise or lower the truck axle on demand with default key "U". Naturally, the lifted wheels don't take any wear over time. In the future we intend to make tyre wear a larger portion of the gameplay that affects player's economy. In addition to that, lifting axles don't have to be restricted for trucks only but apply to trailers axles as well. Please, add side masks for the 6x2 and 6x4 like the 4x2 have already. They add a nicer look. "when it's done" HAHAHAHA By SCS it can take a lot of time! So when it´s done? Never seen a tag axle or lift axle truck or trailer here in NZ, or the new DAF either, so this update's a bit of a throwaway update for me! Add more 2 lane roads with passing lanes like on SH1 (main road in NZ) please SCS. Only for trucks ? or for Trailers also? Not sure which part of NZ kiwi trucker is from but I've seen plenty of empty logging trucks and trailers with raised axels. I've even seen a logging trucks carrying their logging trailer to save wear and tear on the trailer. Christchurch mate, see the trailers on loggers and the occasional steering tags on bin trucks, but never a raise axle logging truck. Good addition to the game. Do you think you can do something about the truck shutting down if any parts gets beyond 20% wear? The tires don't even affect the engine staying on. Maybe make it slower but not shut it down. Cool... 1.14 update will be very interesting. The update is coming when ready, I think they wouldn't give a date when you still know that an unexpected bug can delay it and make a lot of people mad. Nice work SCS, and I can't wait to see your further updates about tyre wear! When will be this update? I ready to buy it! Then we just need turning axels on trailer. One question will be all trucks in the game to use this option on axis? Sim amigo sera para todos os veículos, agora termos 5 opções de chassis e não apenas 3 como é hoje. Nice, But keep in mind that on Scania trucks the hub's arnt the same on trucks with lift axle on twin heels. Stupid question but what is the advantage or disadvantage of using a mid-lift versus a tag-lift? What are the differences? Slightly shorter turning radius of tractor unit I would suppose, though it can't be thát much different/better/worse. I'm not a trucker, but I think they lift the rear axle in Norway to get more grip when it snows. I like how SCS teases with the new DAF in these screens to make the impatience kids even more impatience LOL. I have a filing that this update will be implemented in the coming days.. keep it up. Welcome feature. I hope passing the Trameri gate and quarry will happen easier/differently with 6x2/4 Midlift with reduced possibility of getting stuck. You should create this feature on the trailers too! Wow, nice work SCS. I think that these little touches is what makes this game. No game ever made such detailed interior views and interior options (adjusting seats and mirrors etc). I'm also really looking forward to driving the Daf. Keep going SCS, we as patient people have the competence to remain calm even if the estimated release date is long over. For me it is particularly important that this innovation will be calculated physical model and to influence the behavior of the truck! Respect for SCS! I hope seating (cabin) driver position options will come with this update. Also Going East DLC is awesome. Thanks from Republic of Turkey. Do you plan on doing the side skirts as well? Also, what about adding a FOV slider in the seat adjustment menu? Awesome! Please also make original rims for trucks. Do the lifted wheels turn if they scrape a bump or are they always frozen when lifted? Seperate Wheels from Tyres please.... I want to choose my wheels and tyres separately. Or do matching rear wheels to the front wheels. ETS2 is a great game and its updates is nice too. But i wonder why those updates ar difference between steam and games on cd version? I have cd version and want to drive high and heavy loads too, but it was only steam version who got that. Since i and others who bought the cd version have paid for the game equally those who bought the steam version should we have the same stuff.Beforehand thank you very much. Hei. what was in the last update(1.13.4.1s)? I have a feeling the new DAF will be coming out VERY SOON! Maybe 1.14 soon! I'm hiped about the new Mercedes Actros. I've been waiting for that truck for a loooooooooong time. probably a year? AWESOME, FAST SELL STEAM I WANNA BUY IT ! But you should add FIN!!!! I hope together with these axes there will be new animation of indicators in a inter. I think now is the good time for a steam public beta :) also really hope the new DAF got its own engine sound. Guys at this point you should revise the trailer sitting positon too! On 6x4 the trailer's sitting waaaay back than it should be. This is brilliant. I have been waiting for this in ETS2. Thanks SCS !!! It would be good to have some "alerts", like a sound that plays when you don't have enough pressure in brakes. that feature is already present, in the gameplay options, select "air brakes simulation" and you will have the pressure rating and it tyells you when brake pressure is down. Very nice! Thank you SCS for bringing more features to an already great game! How about this: introduce used truck market to the game. Add an option to purchase a used truck at the large dealer, with customization features, since there is a shop on premises. Make small dealers used truck dealers only, and limit their inventory to the 4 trucks that are on display. Since these dealers have no shop, the trucks should be purchased as-is, with no customization available at the dealer. And since it will be a used truck dealer, make them not brand-dependent. It's just a thought. I know you have your own plans, and thank you for all the updates! Nice! Can't wait to play it when it's released. Please, think about rigid and dolly!!! And seasons!!! Important new features for Scandinavian Dlc! More axle configurations would be nice, that'd be about time too. 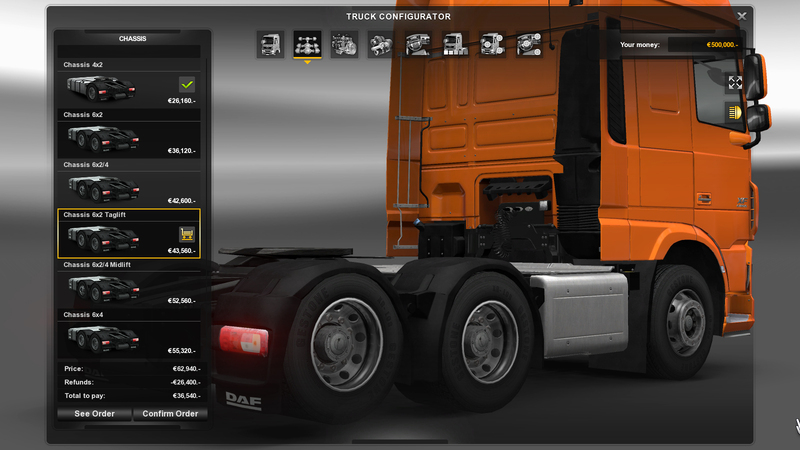 We have a DLC dedicated to high power heavy duty transports but no 4 axle pullers. Pulling a 36 foot yacht isn't very demanding at all but pulling a couple of heavy duty transformers or generators or track assembly for a huge quarry excavator would have warranted the use of 4 axle tractor pullers with a steerable tag axle for better turning radius. We should also get 6x2*4 configs real soon to negotiate tight turns with long loads as Unknown above me suggest, read "Trameri terminal" :). Awesome!!!!! Great work, will this effect only our trucks or AI too? If so then jazzy have alot work. that's a very good Q man! would we great to add airlines aswell. and what happened to nameplate capacity of the engine under the window on the door? Lifting axle. Scandinavia? I smell snow! Lifting your axle doesnt have to do anything with snow, lifting your axle is about reducing tyre wear when carrying low wheight cargo's. May I suggest you add floating hints to every update in order for players to better understand the implications and benefits of different modifications and make better decisions that way? DLC Scandinavia will be released in October? November? there is no release date and any date you see on the internet is speculation. nice but i mostly see the other 2 wheels lifted. when are you planning to make the new renault truck? ATS and double trailers !!!! no more funky updates to ets2. Will this update include correct chassis/wheel configuration for the trucks? 6x2 with the 2nd steering axle as 2nd axle has not been done in over 20 years for most brands, and these days no sensible truck maker does it because it's just pointless. The 2nd steering axle is always the last axle because it helps getting the truck's rear end around corners and it has lower tire wear when being at the rear as opposed to being in the middle. Having the 2nd steering axle as #2 is rarely ever done on a tractor unless you've got a 3rd steering axle at the rear like a 10x4 configuration which isn't normally used on tractors except for heavy hauling. None of the brands I've checked offer 6x2 configurations like the one you've got in the game, and they all offer skirts on 6x and 8x configurations which you're missing entirely. Sure, 4x2 trucks are popular over east because they're cheaper, but you get higher axle load and lower traction, and with the high powered trucks you can't utilize all the torque with only one axle. Thus up here in Scandinavia most tractors are 6x4 or 6x4/2, and skirts/side panels are mandatory by law (to keep bicycles from ending up under the wheels). scania streamline, volvo fh 2009 et volvo fh 2012, et d'autre bien entendu. Hi. the last update(1.13.4.1s) what is new? Ja ta close the upgrade? Considering the time you have put in developing this truck, I hope it will be absolutely perfect at any poind of view.